I basically made a candy bar that's baked. 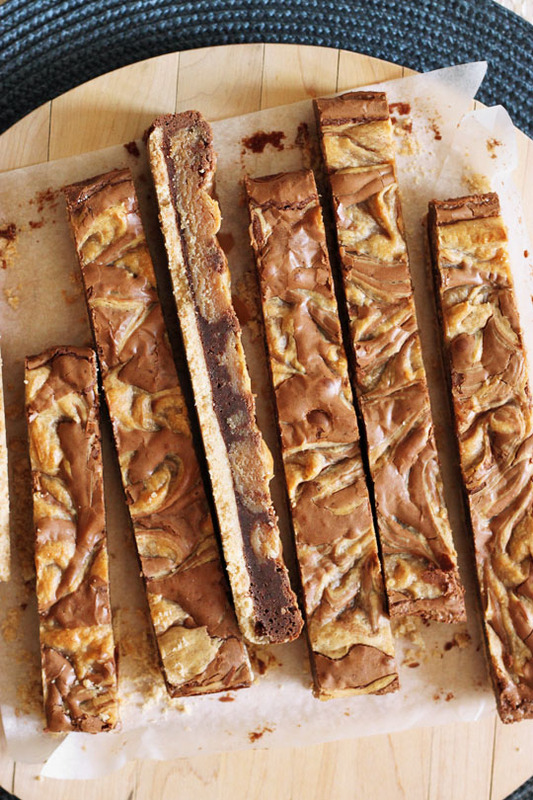 It's kinda like a brownie and somewhat like a Twix, but with peanut butter! This has everything to satisfy a sweet tooth. 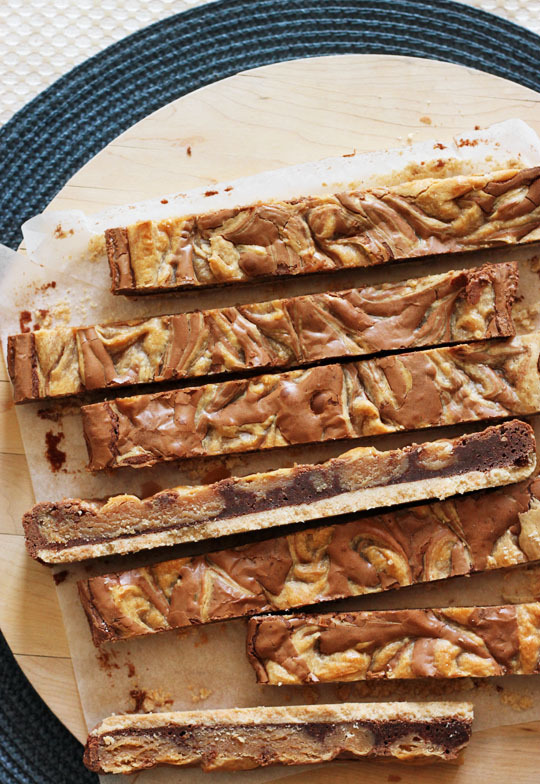 These delicious bars are appropriately named after the chocolate-dipped peanut butter fudge confection called "buckeyes". They are typically formed into balls before getting a dip in chocolate. 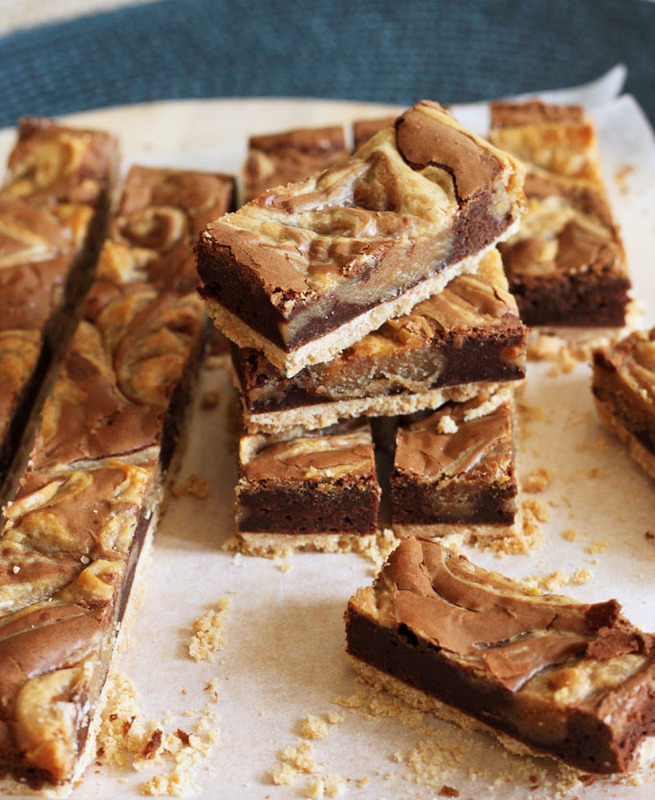 This recipe has all of that and then more with fudgy brownie over a peanut butter cookie crust. If you are not familiar with buckeyes, then a more descriptive name could be Peanut Butter & Chocolate Fudge Cookie Candy Bars - that IS what these are. Totally scandalous! 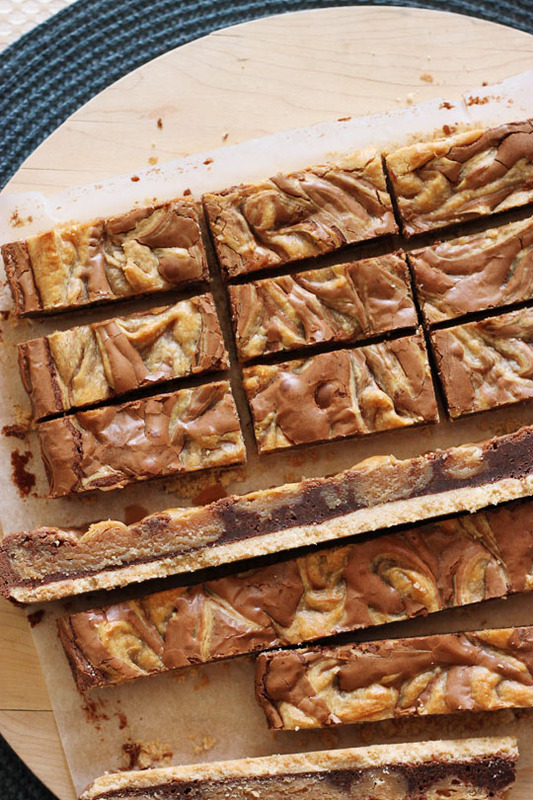 It starts with a shortbread-like peanut butter cookie crust. Bake this first until it gets just a light golden tan and let it cool. Then make a fudgy brownie batter with deep dark chocolate. Here's the part you've been waiting for: combine smooth peanut butter with sweetened condensed milk = peanut butter fudge! Spoon this in dollops over the chocolate mixture and then swirl it through. Bake until just set and the brownie batter has a shiny wrinkly top. 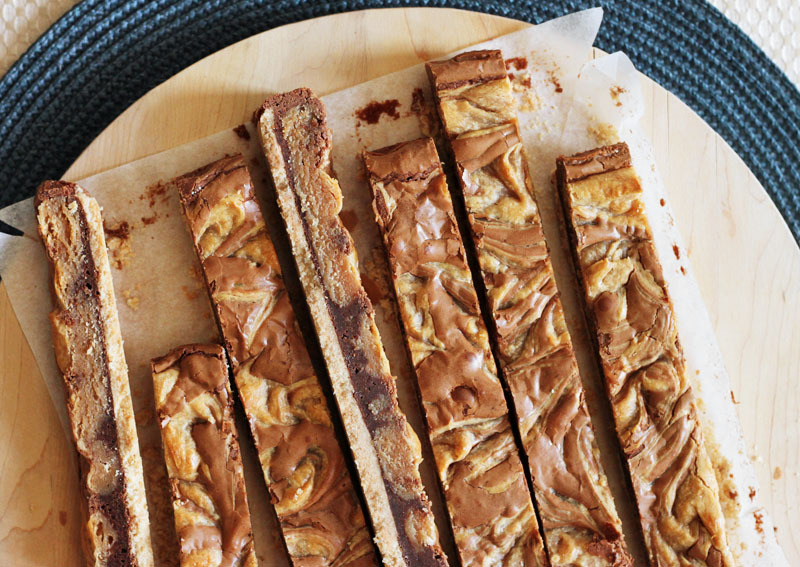 Let cool completely and then slice into bars or squares and enjoy for weeks! They store very well in the fridge so you can nibble at these casually and take your time to make them last, or indulge in a full-sized bar when it's just one of those days! Preheat your oven to 350°F. Line an 8-inch square baking pan with parchment paper, leaving a 2-inch overhang along the sides. To make the crust, combine flour, sugar and salt in a small bowl until blended. Melt together butter and peanut butter until fluid and pour over flour mixture. Stir until moistened and then bring together with your fingertips until it holds together in clumps. Dump it into your lined pan and press down evenly with your hands. Smooth it out evenly and press it down gently with the back of a spoon. Bake for 8-10 minutes, until lightly golden. To make the filling, whisk egg with sugar until well blended. Melt both chocolates with butter and whisk into egg mixture. Stir in flour, vanilla and salt. Dollop chocolate mixture over the pre-baked crust. Stir together condensed milk and peanut butter in a saucepan over low heat until smooth and then dollop in and around the chocolate mixture. Swirl the two mixtures together with the back of a knife. Bake for 18-20 minutes. Transfer to a wire rack to cool completely and then chill for at least 3 hours until firm before slicing into bars.